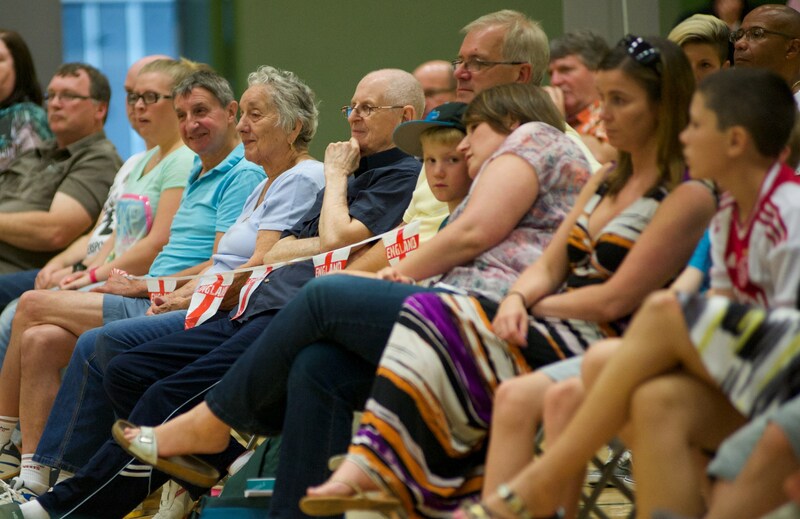 England Mens and Women's teams took on their Australian counterparts at UCLans Sir Tom Finney Sport Centre on 20 July 2014. 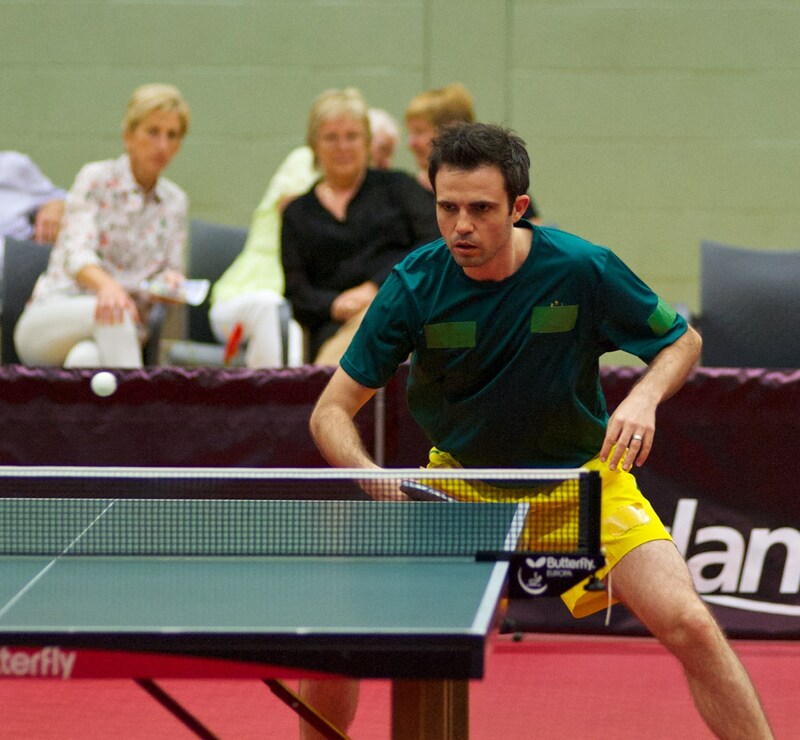 Format: Mens and Womens matches played on separate tables, 2 singles folowed by doubles, followed by singles, followed by doubles. Mens and womens team scores added together for overall winner. Photographs taken by our professional photographer, Chris Nebard. Two very tight games. Notice in the photo how low they keep with knees bent. Henzell, had leads and game points in the first and third game but couldn't quite put Drinkhall away who played with good control and power to see him home. Solid display by Drinkhall. Very few cheap points given away. You could see Henzell was disappointed to loose 3:0 having had good leads in two of the games. Didn't quite seem match sharp - but then he's peaking for the Commonwealths not this match. 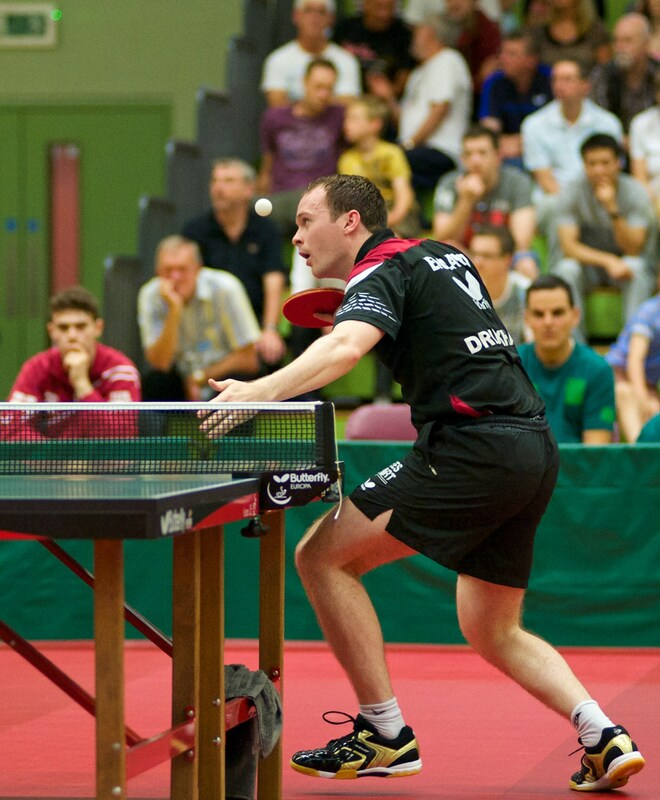 Paul Drinkhall, won the Spanish Open earlier this year, only the 2 English man to win an ITTF Open Tour event. 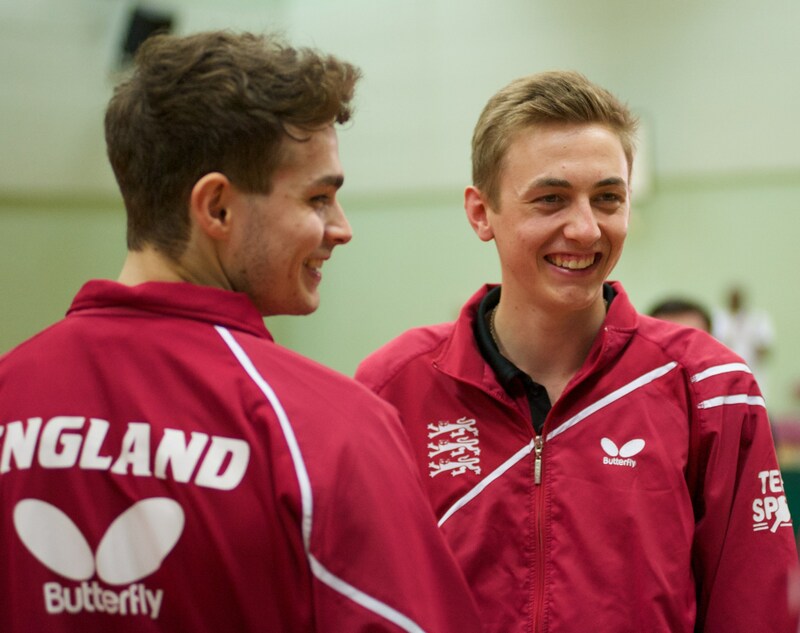 Victory for Drinkhall - England 1 - 0 up. Yan surprising took the first game 11-6 and it was no fluke, he was 9-2 up at one stage. I don't know if Pitchford underestimated him or was taking his time to work him out. Second game was a close affair until near the end when Pitchford pulled away - as better players seem to be able to do. Next two games were more straightforward for Pitchford but Yan definitely has some weapons and potential. 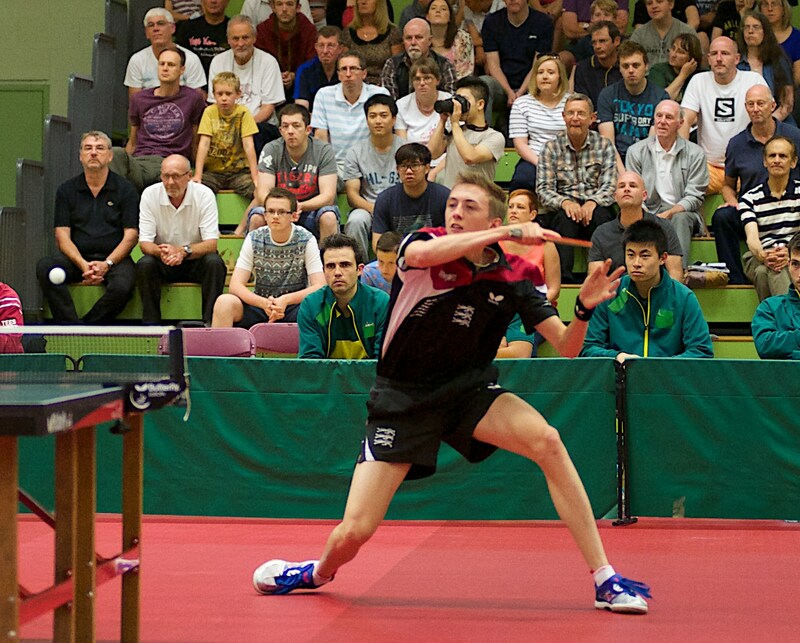 Liam Pitchford, England No.1 at age 21. How does that ankle bend like that? 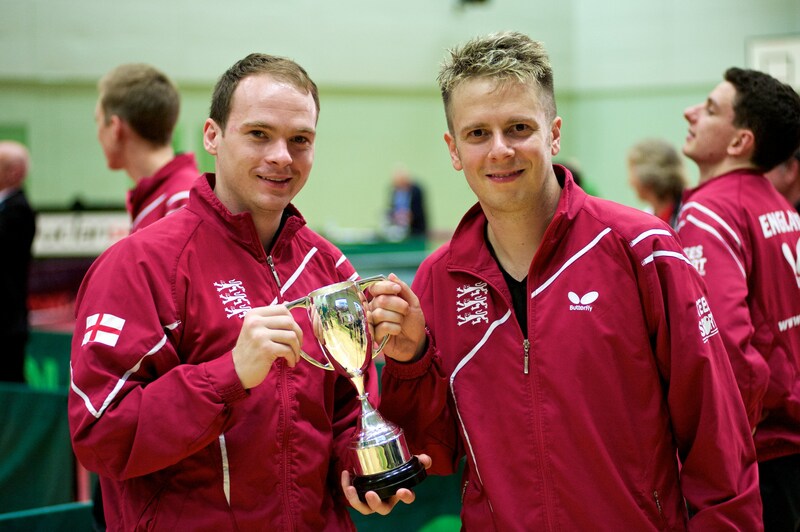 Baggaley/Drinkhall are Englands top doubles pair. They were under real pressure in this match. 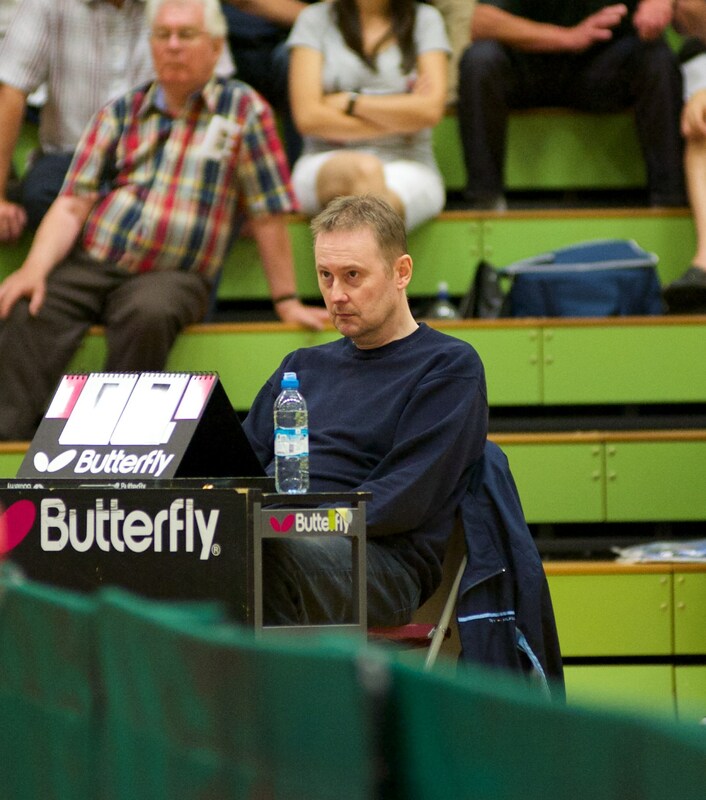 Drinkhall played brilliantly when a couple of match points down in the fourth game. Big big game that. Aussie's should have won it but failed to put away some chances courtesy of Drinkhall's counter hitting. The English pair held it together to win through in 5. Best match of the day. 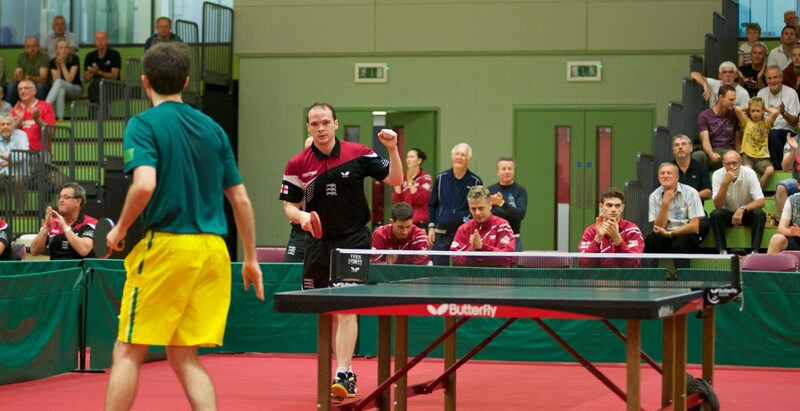 A pumped up Baggaley fighting hard and when he won, he made sure he shook everyone's hands from umpire to score board people. That was a nice touch as we had some young kids keeping score on some of the boards. 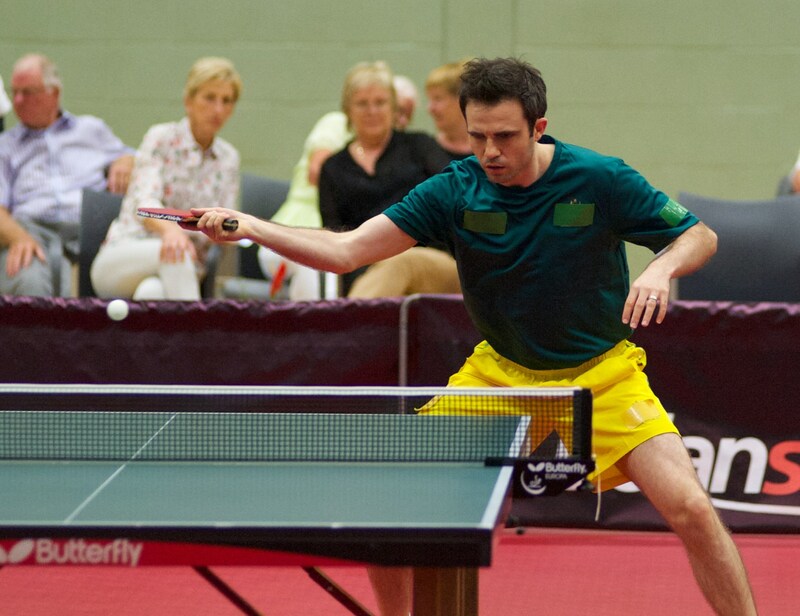 Baggaley carried over that energy and enthusiasm in to his singles match against Powell. Fast, furious and tenacious. He needed all these qualities to win a hard fought encounter with Powell. This match was the last one to finish. 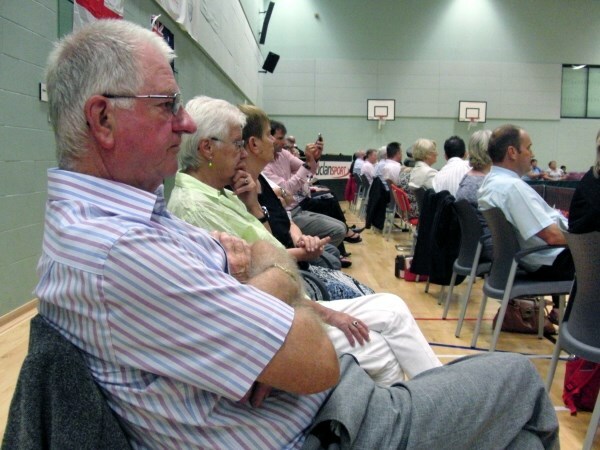 Some very quick powerful rallies, very even and good to watch. 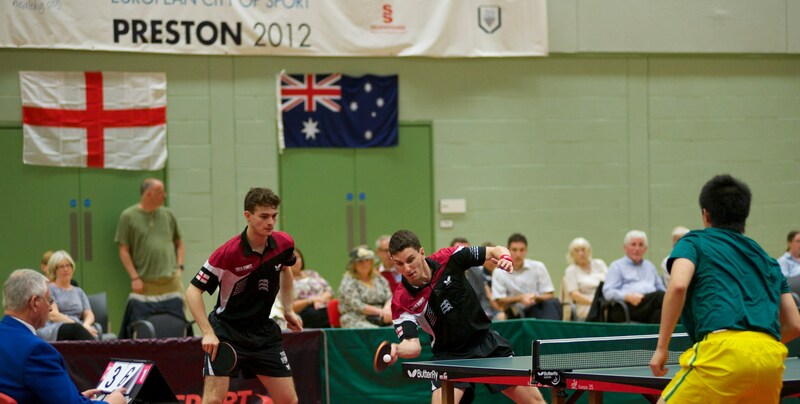 An excellent win by a young English duo rounded off an excellent team performance for the men. England 5 v 0 Australia. Youth dominates the England team. The future looks bright. Sibley started well but then began to make some mistakes at crucial times. Her body language and reactions showed she wasn't happy with the way she was playing and despite having a big lead in the second game, it turned in to a surprising loss for Sibley - but credit to Zhang who played a good solid match. Tapper seemed young and inexperienced and a little nervous. Drinkhall has added some aggressive shots to her arsenal. Last time I watched her, she used to chop and chop and chop with the occasional aggressive shot, not today. Drinkhall did a number on Tapper. Tapper couldn't handle the excessive backspin on Drinkhall's chops. She dumped a lot of forehands in to the net or got anxious and tried to hit through the spin and made mistakes by hitting long. After the first game, it seemed that Tapper had been told to loop the ball and push the ball and loop the ball and push the ball but she couldn't do that consistently and Drinkhall was picking her off with some comfort when the chance arose. Drinkhall won at a canter. For Tapper, it will be a good learning experience against a style of play unfortunately rarely seen in the women's game. 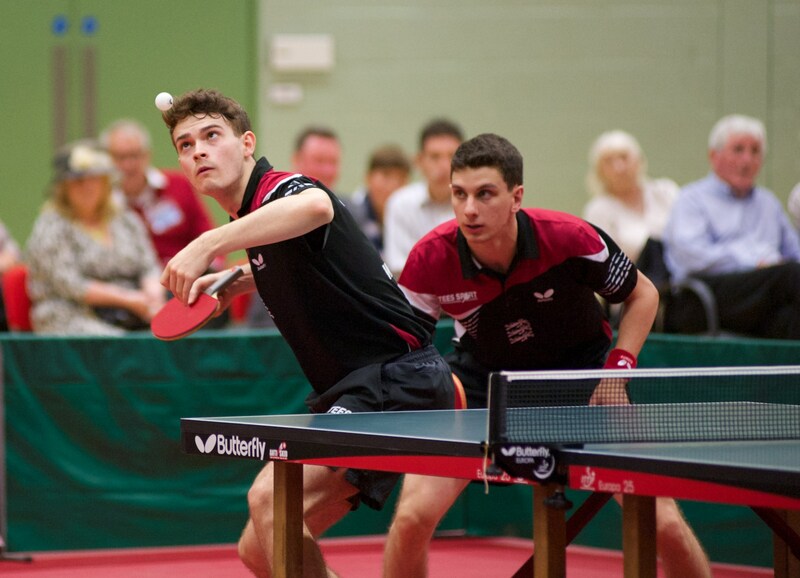 Drinkhall/Sibley are the English number one pair. Today though, when Drinkhall defended, the Aussie's were able to attack and Sibley isn't a defender so she was taken out of her comfort zone having to fend off Australian attacks. With Sibley slightly off form and carrying the disappointment of her singles defeat the Aussies were in control of this match for most of the time - once they benefited from a fortunate net at a crucial time in the second game. Australia ran out 3-1 winners. Being an up to the table blocker and hitter / counter hitter and very fast and mobile on her feet Miao Miao gave Tin Tin Ho all sorts of problems. Miao Miao is also unique in that she uses medium pimples on her forehand and short pimples on her backhand. Quite often Ho would top spin long so I don't know if the skidding flatter ball with less spin from Miao Miao was throwing Ho's timing off or if she couldn't adjust her bat angle in time because of the speed of Miao's hits and drives and blocks. Whatever, Tin Tin Ho didn't seem to be able to cope with Miao's style - this time - and although Tin Tin Ho had a lead in the second game Miao always looked like she had something in reserve running out a comfortable 3:0 winner. At only 15 Ho has youth on her side and in time she'll surpass Miao but she's still learning and this would be invaluable experience for her. Nice girl by all accounts too - when she's not playing table tennis she's out with her school books studying. Sibley, as senior partner was really supportive of Ho, encouraging her to play the right shot and seemingly telling her not to worry if she did that and made a mistake - I'm not brilliant at lip reading! After the Aussie's surrendered a lead in the first game, Sibley and Ho took control. Tapper was still nervous and I felt for her a little bit. 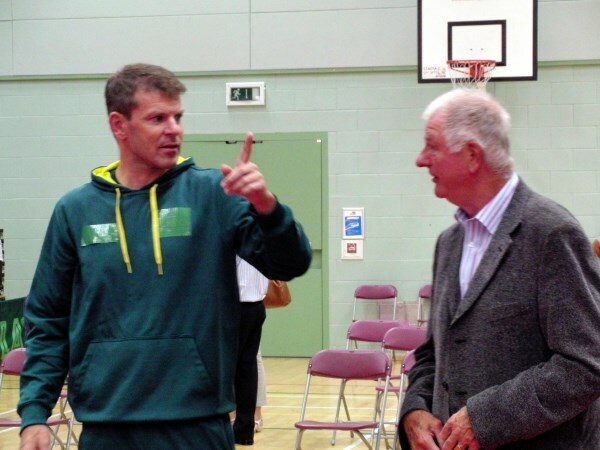 But then I thought what I'd do to be able to play for my country and travel the world - sympathy gone! 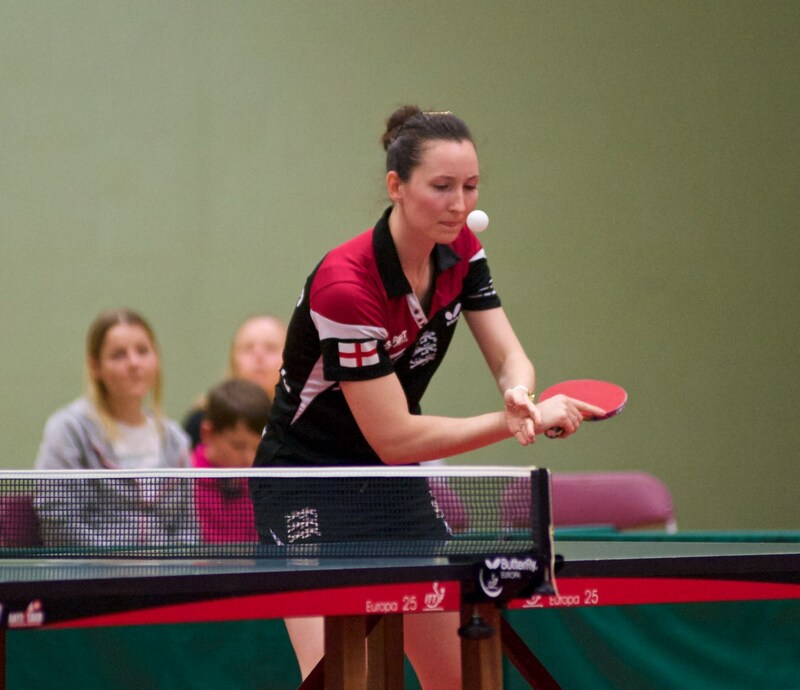 Dispite the Aussie's winning the third game - which I was pleased to see for Tapper - England never really looked in danger as Sibley guided the English duo home and gave the English women's team something good to finish on with a 3-1 victory in their doubles. Final Match Score 3:2 Australia win. Suprisingly England didn't play either Hanna Hicks or Karina Le Fevre and Australia didn't play Jian Fang Lay. I'm not sure if that anything to do with the draw for the commonwealth games team event but it was still a very good win for the Australian women which would boost their confidence and a valuable learning experience for the English women and an indication of what they still need to work on in the short period of time they had left. Final overall score 7:3 England. 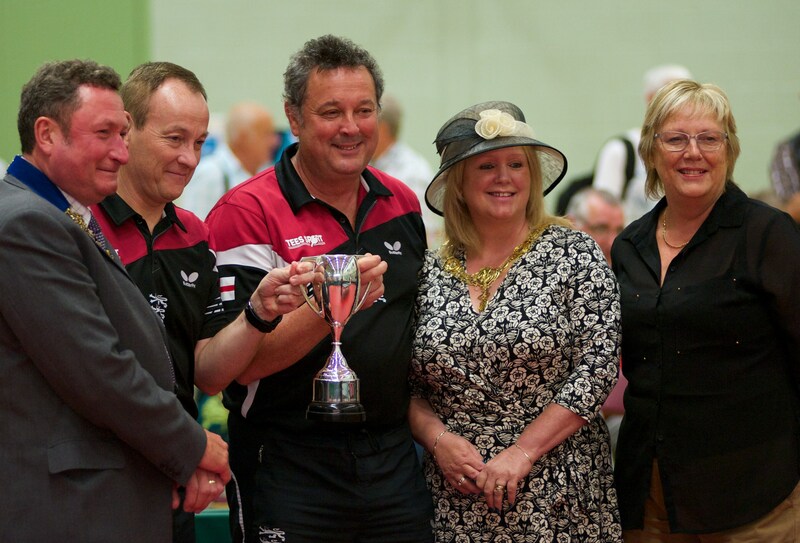 England's coaches went up to receive the trophy from Preston's mayor Nick Pomfret and his wife Barbara. 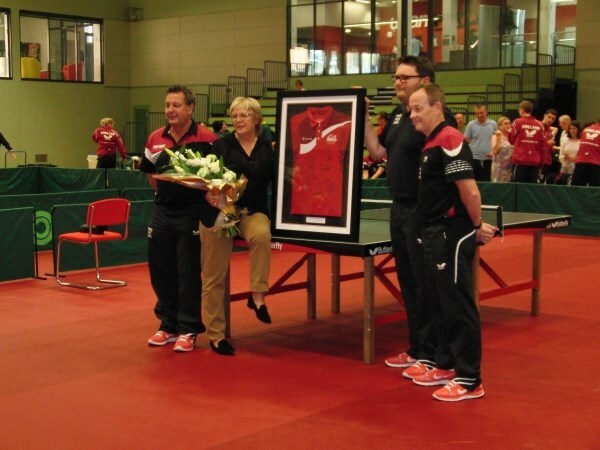 After winning the trophy the England team posed with Jill Parker (nee Hamersley) who'd been presented with a special award on her retirement from involvement in the England setup - an England shirt signed by all the players and staff. Jim Clegg - and this is Jim having fun! It had been a long day - but it had been enjoyable, and that's what it's all about. 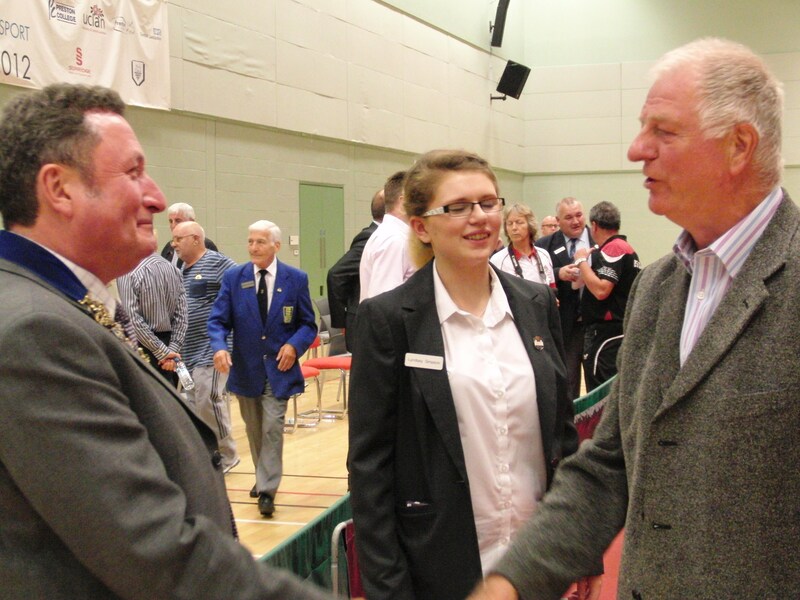 Thanks to Jim, the unsung helpers from Preston and Blackpool TTC's, Dave Evans, UCLan, Table Tennis England, the England and Astralian teams and our members for supporting the event.